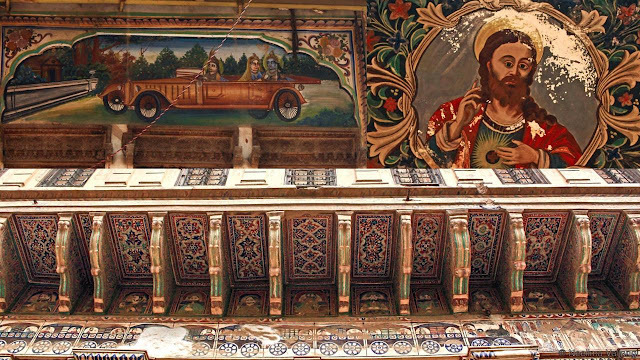 Forgotten in the barren landscapes of Rajasthan’s Thar Desert, the Shekhawati region was once home to the unabashed opulence of India’s billionaires. 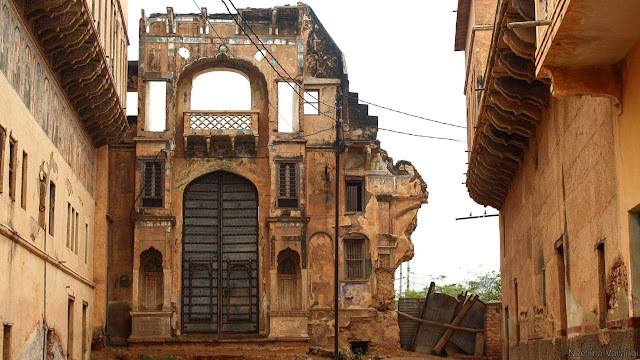 Today, many of the billionaires’ grand havelis (mansions) are crumbling – the fading frescoes marking the only vestiges of the area’s vanished glory. 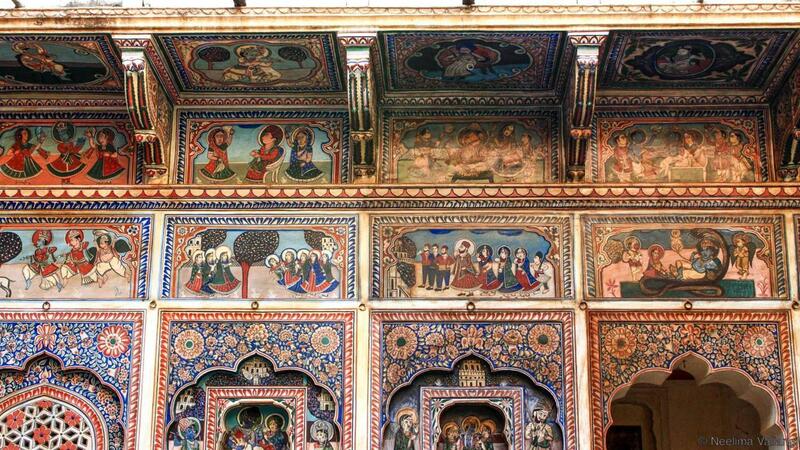 With paintings covering nearly every inch of the grand havelis, the towns and villages of Shekhawati encompass the world’s largest concentration of magnificent frescoes in a single region. 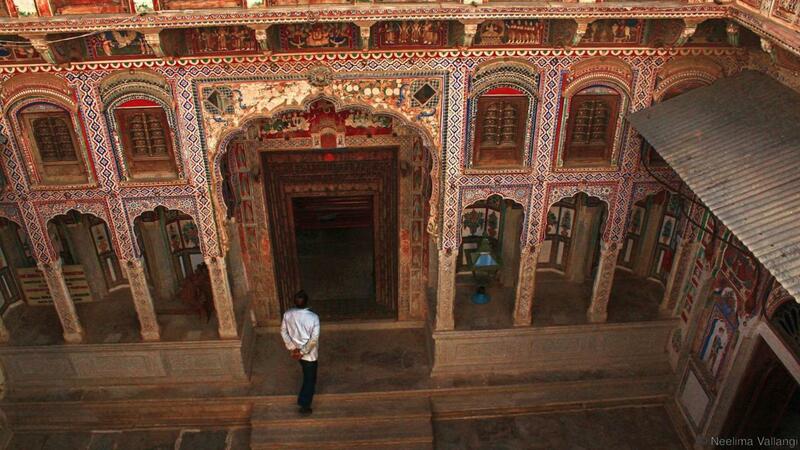 To protect these once grand estates from crumbling further, two districts within Shekhawati have banned the sale of the havelis to anyone who could harm their heritage look. Their aim is to conserve and promote Shekhawati as a tourist destination. 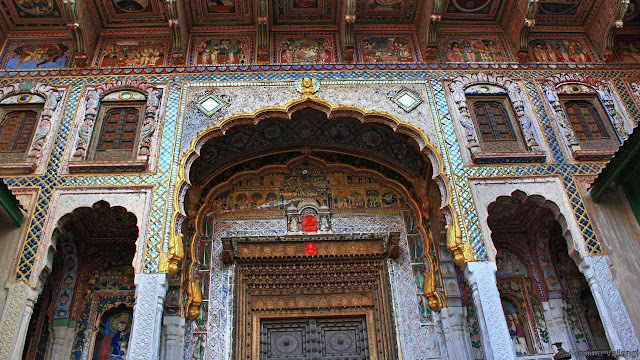 Founded by the eponymous Rajput chieftain Rao Shekha in the late 15th Century, Shekhawati prospered immensely at the turn of the 19th Century. The region reduced taxes to lure merchants and diverted all caravan trade from the nearby commercial centres of Jaipur and Bikaner. Merchants belonging to the Marwari and Bania community, a renowned ethnic trading group in India, moved into Shekhawati from the surrounding towns, and amassed great wealth through a flourishing trade in opium, cotton and spices. Modest merchant homes started giving way to grand mansions by the end of the 19th Century. When trade moved from caravan routes to sea routes and railways in the 1820s, Rajasthan’s trade centres were on a steady decline. 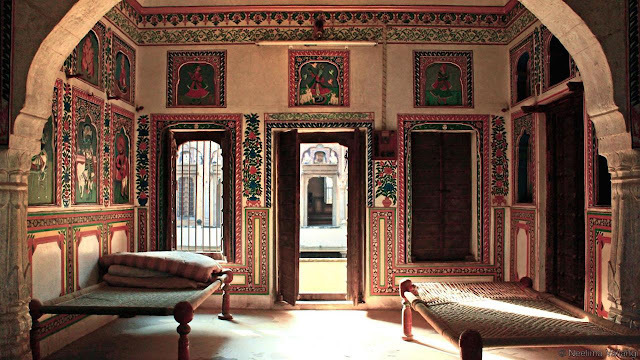 However, the enterprising merchants of Shekhawati followed the money trail and moved to the fledgling port towns of Bombay and Calcutta on the Indian coast, sending back enormous amounts of money to their homes in Shekhawati and thus heralding an era of uniquely painted havelis that acted as lavish displays of wealth. Most Havelis were built in a similar architectural style – usually two storied buildings with two to four open courtyards arranged within a rectangular block. Each courtyard and the corresponding rooms were designated for specific purposes. The first courtyard after entering the house was for men and their business dealings, the second was for women and the other two were for cooking and animal stables. 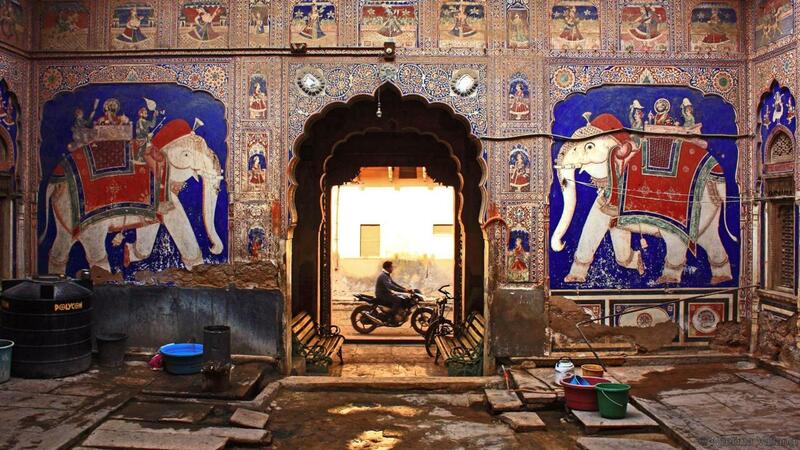 But the merchants left no stone unturned in giving their mansions a distinct look, with ornately carved wooden entrances, pompous mirror work and the defining differentiator: ostentatious paintings depicting daily life and mythology. Painters were first commissioned from the city of Jaipur, but after noticing a rising interest in frescoes, members from the potter community in Shekhawati started learning the craft and created a proliferation of distinct styles across different villages. 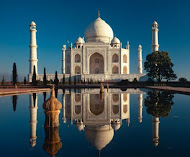 It is not entirely clear if the artists had full reign over the designs or if they were given specific instructions in choosing patterns and mythological scenes. 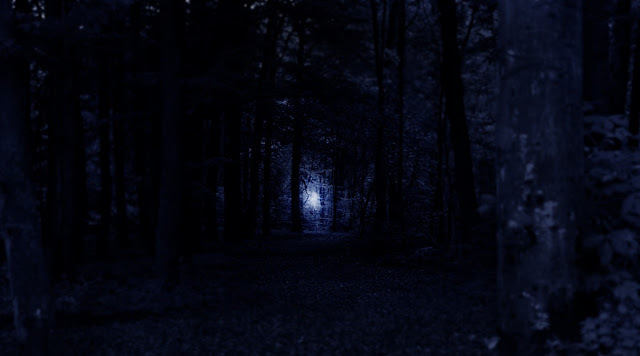 Before the mid-19th Century, traditional pigments made from minerals and vegetables dominated the colour palette, with intense shades of reds, maroons, indigo, lapis lazuli and copper blue along with bright yellow supposedly made out cow’s urine. Starting 1860s, synthetic pigments came into use, which were cheaper and offered a wide range of new colours. 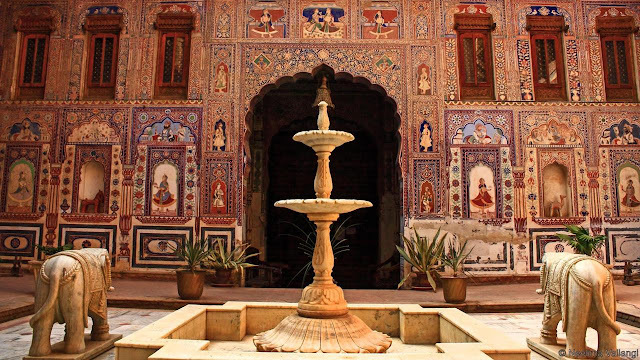 The havelis and frescoes of Shekhawati blossomed until the early 20th Century; after which, the rich business tycoons left the desert wasteland for better opportunities in bustling metropolises like Bombay and Calcutta and even abroad. 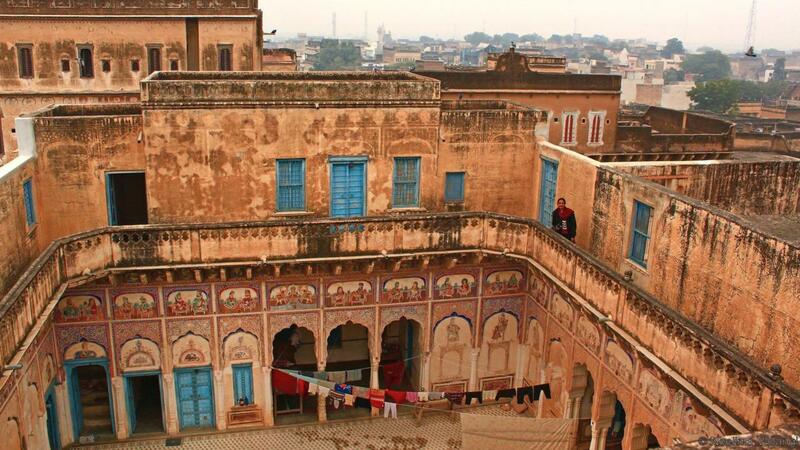 After the trade moved elsewhere, there was little development in the arid lands of Shekhawati, and the havelis were abandoned for good. Some of the biggest names in the Indian and global business scene today – including the likes of the steel baron Laxmi Mittal, Kumar Birla of Aditya Birla Group, pharmaceutical billionaire Ajay Piramal and Nepal’s only billionaire, Binod K Chaudhary, had their origins in the villages of Shekhawati. In fact, according to Forbes, almost 25% of India’s 100 richest were from Shekhawati. By the 1950s, the thriving towns that had raised these billionaires were falling into steady despair. Selling or renovating these rural family bungalows – some of which could house up to 50 families at once – is a difficult job. The cost of upkeep is high and many of the properties, usually shared between multiple heirs, are embroiled in legal disputes. 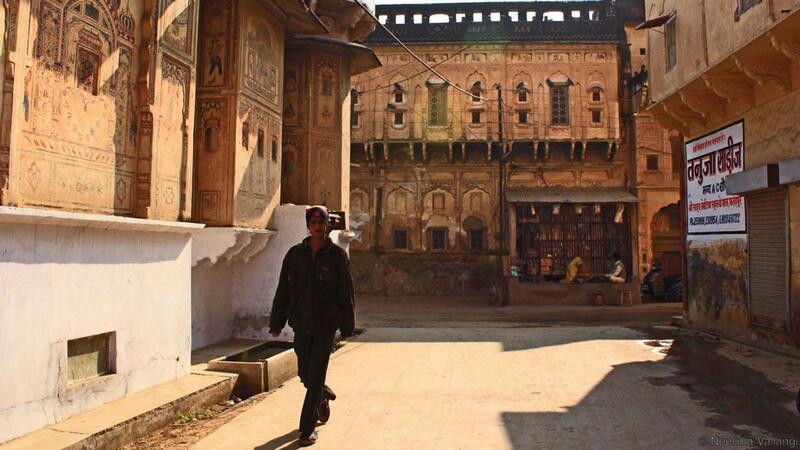 But since havelis are private properties, the government cannot do much to preserve them.